This is a totally refreshing take on fairytales: everything is part of The Tradition (imagine scary music entering). And I'm not kidding when I say the Tradition can be scary. There are people who are sort of chosen, around which the Tradition gathers potential, a power that drives them to follow a certain character type and storyline. And sure that can be nice, but not all fairytales end well. And not all ways of getting to the happy ending are without casualties. For example, you've probably all heard of the tale of Rapunzel (the one where the girl is locked in a tower and lets down her hair for the prince to climb up and save her), but do you remember the prince falling into a bush with thorns, blinding him and almost killing him, wandering the land without sight? This is where the Godmothers come in (only the first in history were real fairies). They monitor the people the Tradition seems to be pushing towards a certain path and try to either bend the Tradition into accepting another role for the person in case or try to make it cause the least amount of harm. Sometimes the role of a Godmother is to test the prince on kindheartedness on his quest and sometimes it takes a bit of matchmaking to distract an Evil Sorceress from cursing a princess at birth. Elena Klovis was supposed to be her Kingdom's Cinderella, sadly the prince wasn't suitable and she got stuck playing housemaid to her stepmother without a chance of rescue. That is, until her Godmother showed up and offered her a job: to train as her apprentice and become the next Godmother. And all goes smoothly for a while with Elena being a fast learner and handling matters after becoming Godmother herself. But the Tradition isn't done with Elena. When Elena turns one questing prince into a donkey for his rude behaviour, she doesn't know what's she gotten herself into. 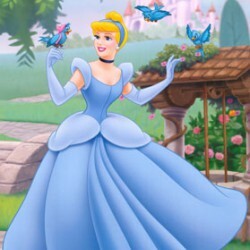 Because she was meant to be a Cinderella, the Tradition tries to get her together with any prince within reasonable distance. But since she's a Godmother as well, the Tradition will force this prince into a nasty role in which he will most likely betray her and break her heart. What will they do when they find themselves drawn to each other? I absolutely loved this book! I love fairytales and now I realise some were rather gruesome, which kids somehow don't pick up on most of the time. I'd never thought about the possibility of other princes attempting to rescue the princess and failing and sometimes also dying because they failed. Elena is a really likable character and the prince she turned into a donkey is as well after learning his lesson. I also loved reconnecting with all the fairytales I loved as a kid, a lot of them appear in the book. 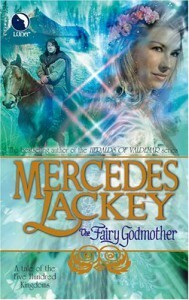 It was a very smooth read, I'd never read anything by Mercedes Lackey before and was pleasantly surprised. I thought it was really original and I'm always looking for a nice new twist to the fairytales I know and love. I'm looking forward to reading the other books in the series!